A lawn that is well kept and maintained throughout the season plays a significant role in any home owner’s life. It helps to increase the value of any home as well as making the home more eye catching to all that pass by consistently. The essential key for any immaculate lawn is consistency in lawn care, such as mowing, mulching and seeding. Most owners find, however, that maintaining this type of consistent lawn care can be time consuming and often choose not to go through with it. With the tips and guidelines listed below, most home owners will find that, with small amounts of time and outside work, any lawn around the country can be made to look beautiful when all is said and done. Saturation is a vital key to maintaining the health of your lawn on a consistent basis. A lawn should be watered a few days each week and monitored to determine how much water the grass and soil are getting. The water should dampen the soil under the grass to a depth of about 6 inches to make sure that the roots are obtaining proper saturation. Fertilizer should be used early in the spring and late in the fall to maintain the health of the grass and the soil. The nutrients within the fertilizer assist in making the grass strong against outside forces, such as lack of water and stamping from feet or other heavy sources. All home owners should speak with a lawn care specialist to determine the type of fertilizer that should be used during each season as well as the amount that should be laid down evenly across their lawn. Make sure that all weeds, crab grass and pests are treated as soon as possible. These outside sources will cause havoc upon your lawn and will not clear up without proper attention. Most hardware and lawn stores will have an over abundance of materials to rid any grass of these nuisances as well as create a shield of protection for any future attacks. It is best to use a lawn mower that allows for any grass clippings to stay on the grass after a mow has been done. These grass clippings can filter their way back down into the lawn and soil and provide extra food and nutrients that can further enrich soil and promote healthy growth. Make sure that all lawn mowers are properly maintained during the lawn care season. Blades can sometimes feel the wear and tear of the season and become duller over time. A dull blade can tear up grass and soil from the ground rather than mowing the grass properly. Monitor the sharpness of all blades on your lawn mower after each use and repair and/or replace as necessary. Treat the bare spots that happen over time. The beginning and end of each lawn season will bring about bare spots that may have succumbed to the effects of Mother Nature or over saturation. These spots should be properly maintained in the spring with soil dispersion and fertilizer at the very beginning of the season so that there is ample time for the seeds to grow. The same process should be followed in the months of fall so that the seeds can be properly laid in the ground in preparation for normal grown once spring has arrived. Evenly mow and edge the entire lawn accordingly. This step is essential towards providing a pleasant looking grass as well as avoiding any areas that may foster pests and or weeds due to over saturation. Mulch or edge any areas that are not to be cut, such as trees and flowers beds. This will assist in decreasing your time mowing the lawn as well as avoiding any accidents that will tear up the blades of your edging machine and or lawn mower. Never mow the grass in the same way each time. Most lawn care professionals alternate between different patterns for mowing to promote irrigation to all parts of the soil on a consistent basis after each cut. Just wanted to let you guys know I really like the information on this site. I actually shared the link to one of my lawn care clients that was asking for more information on upkeep of his yard. You guys have some good info. Were we live there is a problem with some type of poison ivy, oak, or sumack. I can’t walk out on the back deck to the grill or I will get it. Is there anything we can have a lawn service do to get rid of this issue. I have never had a problem before with poison. There is nothing on the deck, unless its under it, but its nowhere I can see. It’s getting nice early this year and I don’t want to stay inside. what are the rules for de thaching lawns? We have spots of dead grass all different shapes. The rest of our grass looks fairly well for our Gillette,WY lawn. We have treated it with fertilizer one time. Last year Tru Green took care of grass. But can not afford it thisnyear. Our lawn area is very small. It was covered by snow a lot. Especially in the back. We live in a town house with small areas. Thanks for you input as to the dead spots. My yard is plegged with sticker weeds, with yellow flowers and a shallow root system. When i walk in the yard, the stickers stick in my shoes and are being transplanted to other spots very easily. I need some help. My house has pavers out back i want to tear out and lay sod. But under the pavers is quarry blend stone and 3/4″ stone about 4-5″. Can i put an inch or so of top soil on top of the stone and put sod on top. Will the sod be able to make it. I live in south jersey. I have a rather large lawn in the Mid-Atlantic area that has been totally overtaken by clover. I want to over seed now but I am concerned of the results. Hello. Do you have an e-mail address where I can send pics of what I think is Fungus or bus problems with my lawn to get an opinion? I have two female labs and just bought a house. I’ve heard that female dog urine can ruin or mess up your lawn. Is this true? Can anything be done to fix the spots or anything like that? I live in Thailand and i am having trouble finding a good lawn feed. I need something that will kill any weeds and also give good fertilization to the grass. Great read! 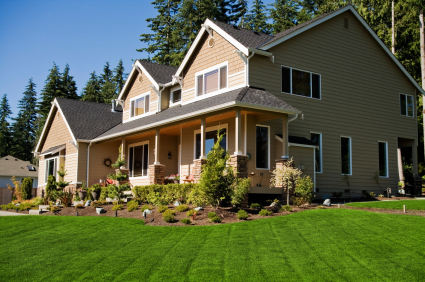 Lawn care is important in making your home look great and stand out! You can always call your local lawn care company and get advice or a quote to improve your lawn!